Located on a quiet residential street in Redcliff, Alberta, St. Ambrose Anglican Church is distinguished by its buttressed brick masonry exterior, steeply-pitched gable roof and pointed arch windows. These characteristics strongly identify the 1914 church with the Gothic Revival style popular in the Victorian era for ecclesiastical architecture in England, a style also eagerly adopted by Anglican, Presbyterian, Methodist and Congregational churches across Canada. Unlike many churches, though, St. Ambrose was modelled on small Anglican parish churches in England and is a variant of the Gothic Revival style seldom found in Alberta. St. Ambrose’s architecture hearkens back to England but the building’s local roots are evident in the “clinker brick” masonry exterior, an overfired brick with distinctive irregular or lumpy shapes and striking colour variations. Clinker brick resulted from high firing temperatures in the kiln which caused the clay to partly vitrify or melt, sometimes to the point where clumps of bricks would fuse together and had to be broken apart. This lack of uniformity was appreciated for its decorative qualities and the clinker brick at St. Ambrose was produced at the Redcliff Brick and Coal Company just blocks away. The combination of far-reaching colonial stylistic influences and distinctive local materials contributed to the church’s designation as a Provincial Historic Resource in 2008. 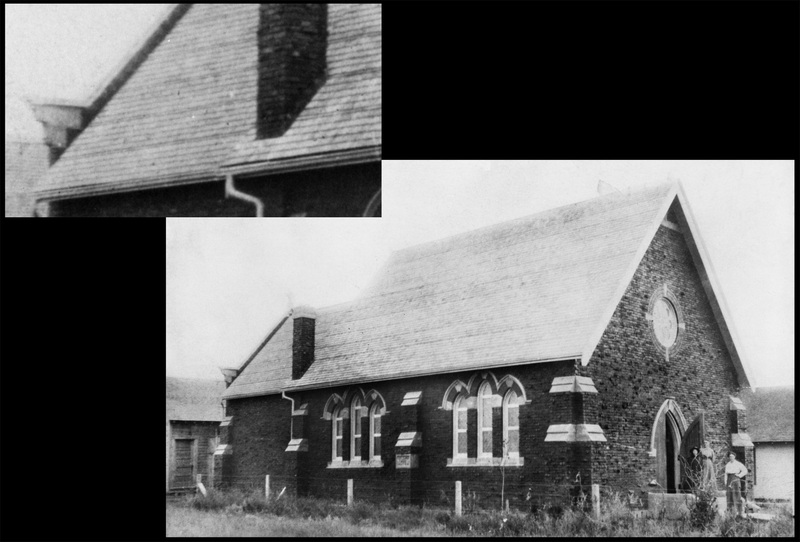 St. Ambrose Church from the northwest in 1914, with inset showing the original narrow exposure, traditional step flashings, and rows of slightly offset shingles (inset) to create shadow lines and decorative horizontal bands across the roof. Glenbow Archives photograph NA -2701-5. This week’s blog post is guest-authored by the Willmore Wilderness Preservation and Historical Foundation and features work conducted in the summer of 2016 with the support of the Government of Alberta through the Alberta Historical Resources Foundation. We hope you enjoy their fascinating stories and stunning photographs. For this week’s blog post we welcome Meg Stanley, a historian with Parks Canada. Meg has done extensive research on war-related place names in the Canadian Rocky Mountains, particularly place names in the National Parks. We welcome her to RETROactive! During the First World War, the Geographic Board of Canada assigned place names to various geographic features in the southern Rocky Mountains commemorating battles, military leaders, individual soldiers, and others with strong associations with the war. The Board’s inscription of the war onto the mountain landscape began in 1915 and continued through the war years and into the early 1920s.